In this paper we introduce an abstract algebra for reasoning about concurrent programs, that includes an abstract algebra of atomic steps, with sub-algebras of program and environment steps, and an abstract synchronisation operator. We show how the abstract synchronisation operator can be instantiated as a synchronous parallel operator with interpretations in rely-guarantee concurrency for shared-memory systems, and in process algebras CCS and CSP. It is also instantiated as a weak conjunction operator, an operator that is useful for the specification of rely and guarantee conditions in rely/guarantee concurrency. The main differences between the parallel and weak conjunction instantiations of the synchronisation operator are how they combine individual atomic steps. Lemmas common to these different instantiations are proved once using the axiomatisation of the abstract synchronous operator. 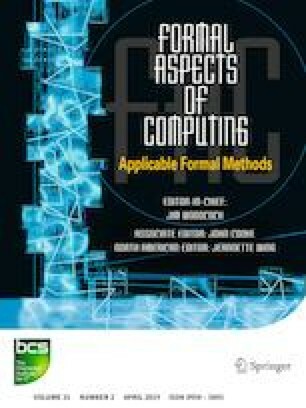 Using the sub-algebras of program and environment atomic steps, rely and guarantee conditions, as well as Morgan-style specification commands, are defined at a high-level of abstraction in the program algebra. Lifting these concepts from rely/guarantee concurrency to a higher level of abstraction makes them more widely applicable. We demonstrate the practicality of the algebra by showing how a core law from rely-guarantee theory, the parallel introduction law, can be abstracted and verified easily in the algebra. In addition to proving fundamental properties for reasoning about concurrent shared-variable programs, the algebra is instantiated to prove abstract process synchronisation properties familiar from the process algebras CCS and CSP. The algebra has been encoded in Isabelle/HOL to provide a basis for tool support for concurrent program verification based on the rely/guarantee technique. It facilitates simpler, more general, proofs that allow a higher level of automation than what is possible in low-level, model-specific interpretations. We would like to thank Cliff Jones, Kim Solin, Andrius Velykis and the anonymous referees for feedback on this research. This work was supported by Australian Research Council (ARC) Discovery Project DP130102901.